Episode 137: "Viva Las Pegasus"
Quick Take: Any time my two favorites of the Mane Six get an episode together, my hopes are high. There's not as much established history between them to draw on, but they get on well together, have some understandable and well-depicted conflict, and are the perfect ponies for this particular problem (as we've come to expect from Map episodes). Putting Flim and Flam to use on the heroes' side without even a hint of reform is a bold and creative move that's just overall nicely done. I especially like the new guest characters in this story, and the creators really showed their work (whether by research or experience) in putting little nods to real-life Las Vegas specifics throughout the episode, even to the point of mimicking posters of famous Vegas shows. This adds spice to a relatively simple story, and having Gladmane wise to the heroes' first scheme makes that story interesting enough that I don't mind how quickly things wrap up once Gladmane is finally exposed. 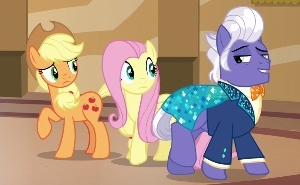 The end result is a quieter episode than the similarly fun Saddle Row Review, but I give it extra points for portraying relationship dynamics in the adult world, and having Fluttershy and Applejack demonstrate intelligent tolerance rather than naive forgiveness toward the unrepentant Flim Flam Brothers. Click HERE for Character Appearance List and Screentime.